THE CRISIS IN BURUNDI RIGHT NOW IS CAUSED BY MR PIERRE NKURUNZIZA. Viewers corner is appealing to the United Nations, the African Union, the International criminal court and all other agencies world wide to ask Mr Pierre Nkurunziza, the President of Burundi to step down as the president of Burundi because people are dying on daily basis as a result of what he caused in the country. 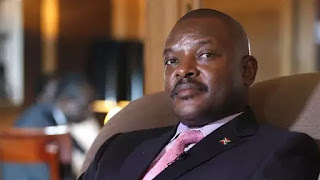 If he had respected the constitution of Burundi which specifies only two terms for which Mr Pierre Nkurunziza had successfully completed, there would never be any problem in Burundi but he violated the law and went ahead to install himself the third time as the president of Burundi which is not right. Viewers corner is appealing once again to Mr Pierre Nkurunziza to step down for the interest of peace and save the lives of the innocent people of Burundi.